Some 200 tonnes of oil have leaked from a fuel tank on the stricken cargo ship MSC Napoli, beached off the Devon coast, coastguards have confirmed. The ship has also lost some 200 containers overboard, including two holding "dangerous but low-risk" goods. A sheen of oil eight kilometres (five miles) long is now on the sea surface. The ship suffered structural damage during Thursday's storms and was deliberately beached off Branscombe to stop it sinking in deep water. It is sharply listing and there are fears it could capsize and break up at any time. An operation to pump the remaining oil on board is due to begin on Monday morning. The remaining containers could also then be winched off. The 62,000 tonne vessel was carrying 2,323 containers, 158 of which are classed as having potentially hazardous contents. Of the 200 that have gone overboard, one contained battery acid and perfumes, and one small gas bottles for car airbags. Maritime and Coastguard Agency spokesman Paul Coley said these were "considered dangerous goods but for us they're low-risk." Others housed a variety of goods including BMW motorbikes and car parts. Not all of the containers have been found and some have broken up. Some may have sunk while others could be far out to sea. The ship also contains a further 3,500 tonnes of heavy fuel oil in tanks, but coastguards believe these have not split. They believe 200 tonnes is close to the maximum that will leak out of the ship's engine room. The ship was being towed to Portland Harbour in Dorset for a salvage operation, but on Friday coastguards decided to beach it because of its structural damage - a fracture on both sides. An eight-person salvage team is on board, and a team of divers is being flown in to join them. Environmental damage is so far said to be minimal. 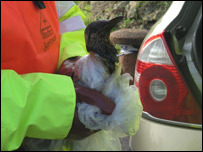 Three oil-covered birds have been found. Residents in nearby Sidmouth have spoken of the concern about the leak. One man told the BBC: "It's a real worry that we could get pollution and there's a lot of wildlife lives on these shores, and certain rare sea birds." Julian Wardlaw, of the Environment Agency, said: "We have an extremely sensitive bit of coastline; we are dealing with a World Heritage Site and we are working to make sure that damage is minimised." 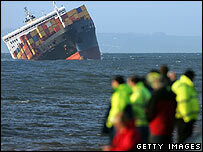 Meanwhile, it has emerged that the ship previously ran aground off Singapore in 2001. It was previously named CMA-CGM Normandie and ran aground in the Strait of Malacca in 2001. The ship subsequently had to undergo "major repairs" in Vietnam, according to Tore Hoifodt, senior vice president at DNV, which classes and inspects cargo ships. 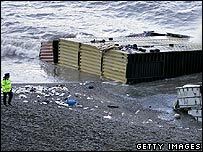 People who may find a washed-up container are being asked to stay well clear and report it to Portland Coastguard on 01305 760439.